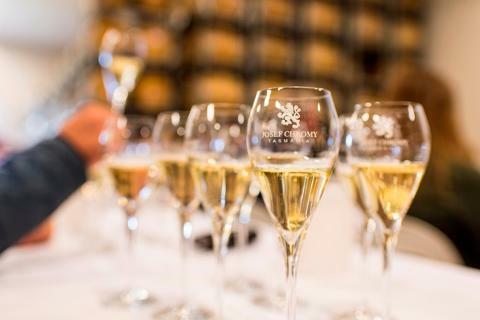 Go behind the scenes and tour the Josef Chromy winery and learn the how traditional method Sparkling wine is made and create a sparkling wine to your own flavour profile. “Tasmania confidently holds its place as Australia’s sparkling capital” and “arguably the greatest region for sparkling wine anywhere in the world out­side of Champagne itself”. Tyson Stelzer International Wine Communicator Of The Year 2015. The art of making sparkling is explained (and tasted along the way) from base wine to corking and wiring. The tour commences at the Cellar Door and takes in the history of the vineyard and the Tasmanian Wine Industry. Guests will be taken through the sparkling wine making and disgorging process, then work with the winemaking team in the laboratory to choose and add the liquour, the final step in sparkling wine making. Each participant will produce a bottle of sparkling to their own taste to enjoy on the day and may order sparkling wine at their own dosage rate to be sent following their visit. Guests conclude with a 2 course lunch matched with wine and a complementary tasting. Available for groups of 2-8 people.